RETRO Vintage 'Doily & Fabric Flag Bunting - Garden Party' Flag Bunting. Bunting flags are traditionally hung up in a babies room but also used for kids rooms and are a great party decoration. Ideal for a Party, Birthday Present, Wedding, Engagement, Hosting a Baby Shower, Photography Prop, Market Stall or just Decorating a room. Would look very pretty at your next Garden Party / BBQ! Perfect for a Wedding. Decorate a wedding venue or use as a photography prop for a Wedding. THIS ITEM: This RETRO Vintage 'Doily & Fabric Flag Bunting' adds charm and style to any room! Total length is FOUR & A HALF metres (4.5m) / over 14 feet approx. 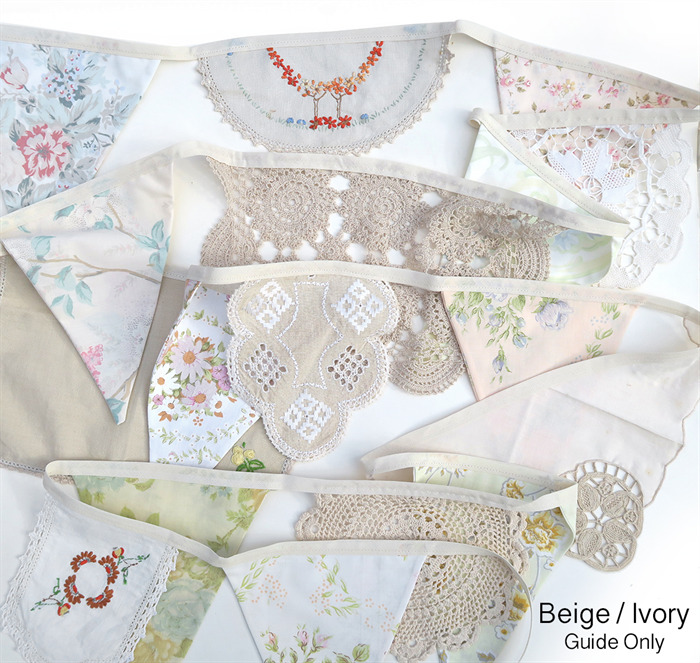 This set of flags are a lovely combination and no two lace flags are the same - Just Divine! This Flag Bunting is double sided/reversible - can be viewed from front or back. There are no unfinished edges on the 'triangle' flags. Your bunting will be similar to the first two listing images. 'Similar but different' fabrics & 'Similar but different' Lace. *** Beige - Tonally, this style of bunting is 'Beige / Ivory'. Your bunting will be similar to the 'forth' listing image. PLEASE let me know which 'colour way' you would like to purchase. If you need to see pics of the actual bunting... just ask! 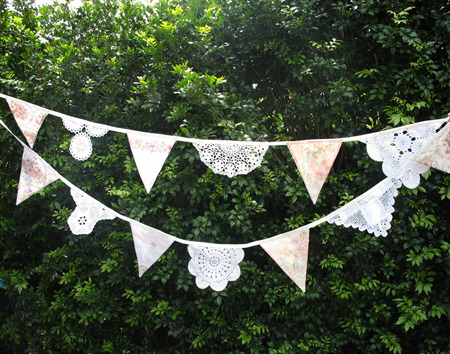 If you require a custom bunting like this, just let me know the colour way (eg. more pinks or blues, etc) and lengths required. * I have many more of these buntings (similar but not exactly the same), that are ALREADY made up but not listed, so if you would like to purchase more than one length, just ask & I can organise a Reserved Custom Listing for you, easy! *** Doilies I have used are vintage with a history and a past, some showing slight signs of age and possible minor imperfections. A lovely selection of: White and Off White hues. 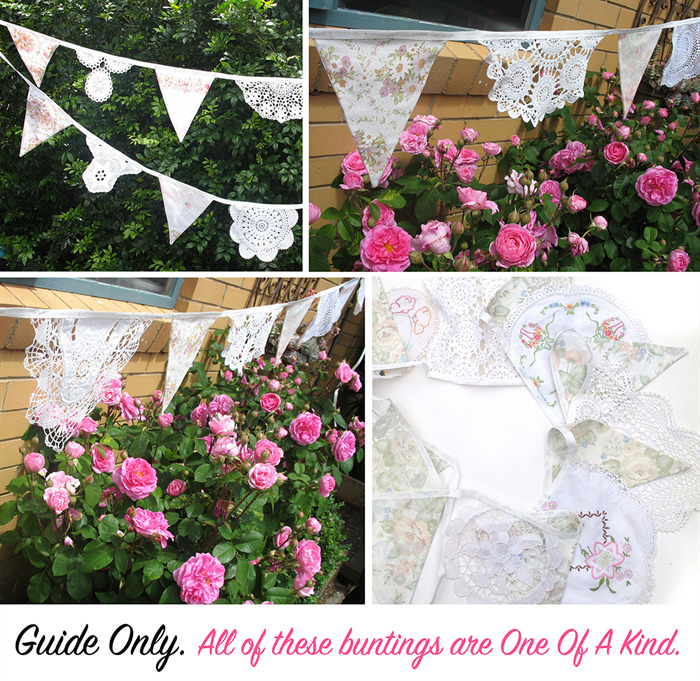 This truly adds to the charm of this ‘one of a kind’ vintage lace bunting. You will be very pleased - A Gorgeous Keepsake. 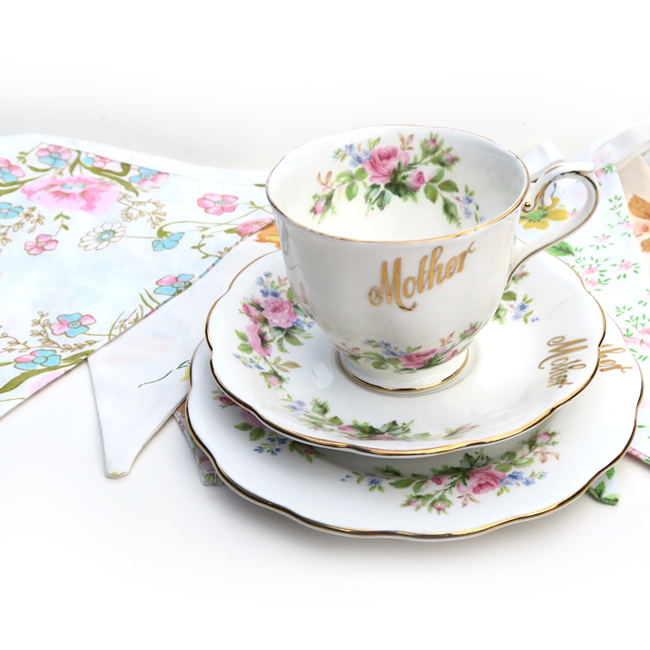 All of our bunting is quality made to a high standard and fabric is chosen carefully for the right combination that you will love. We offer a lovely mix of colours and fabrics to create a special overall look. Most of my Flag Buntings are One of A Kind (OOAK). If you require more that one of these 'Fabric & Lace' Buntings, let me know.